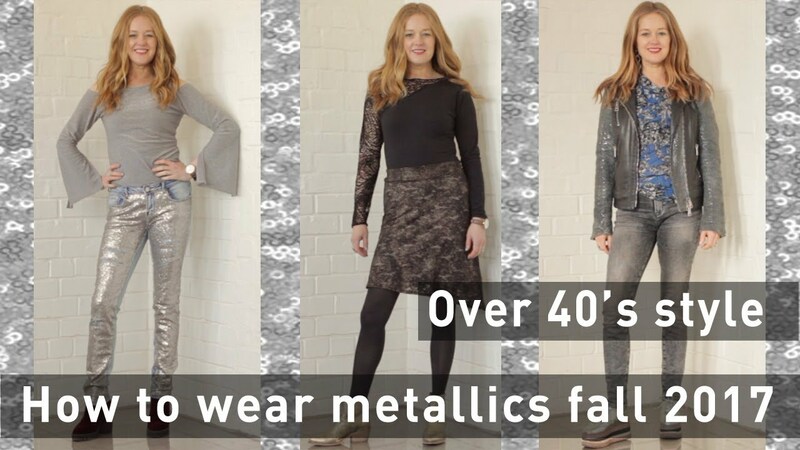 In this video I share my top fashion tips on how to wear metallic fall 2017 trend for women over 40. Metallics have been on trend for quite some time now, but thanks to Karl Lagerfeld of Chanel, they are bigger than ever before. In this video I am going to show you how to wear this gorgeous trend for a fabulous over 40 fall look. Some women are afraid of wearing metallics for fear of looking OTT. But metallics are no longer just for evening wear. In fact, you will even see metallic sport and casual wear. Shimmer and shine: This look is for a woman who is not afraid of standing out. This is a great look for an evening out. If you go for the all out metallic look, be sure to wear something neutral to balance the look. More shimmer and less shine: This look is for a woman who likes the look, but isn’t wanting to go all out. For a slightly more toned down look, wear items in muted metallic shades and accessorize with a bit of shine. Less is more: This look is for a woman who doesn’t want to go all out with this trend, but likes a little shimmer in her life. Choose one metallic piece. Metallic works as a neutral so it doesn’t need to match with anything.